As many quality researchers understand, such predictions allow a scientist to be specific about how to demonstrate that a hypothesis is accurate. My stated hypothesis was: A Corona Satellite was launched from Vandenberg Air Force Base in California on December 9, 1965. Due to an anomaly of sorts, its recovery vehicle separated from the satellite earlier than planned. 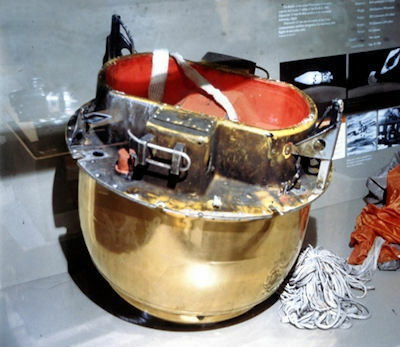 Thus, this Corona recovery vehicle in conjunction with its film bucket is a highly viable candidate for the object that landed in Kecksburg, Pennsylvania on that same date. Once a hypothesis and a prediction are developed, a true scientist does not change them even if the results of the experiment show that they are wrong. An incorrect prediction is not a failure. It merely indicates that the experiment demonstrated new facts that were previously unknown. Experimental information by nature is imperfect. Scientific results usually contain errors. One of my research goals has always involved minimizing errors. Thanks to Mr. Sheaffer’s own recent research, I now have even more information to possibly conduct an ancillary study related to the Kecksbrug UFO mystery. Although the Corona Satellite project was technically declassified around 1995, the contents of some satellites are currently classified—even as I write. Such contents may be classified because of the nature of the nuclear materials they enclosed. Furthermore, NASA has not yet provided a detailed description of the nuclear experiment on board Satellite KH-4A 1027 (NASA has provided detailed descriptions of nuclear experiments on board other Corona Satellites). A NASA document that I obtained in 2017 stated that: There were no data collections returned (for United States Air Force Photo Surveillance Satellite KH-4A 1027). That NASA statement seems to contradict the statement Mr. Sheaffer recently proved in his brilliant critique whereby one of his sources indicated: The condition of the air recovered capsule was normal. Thus, I will probably investigate the capsule condition issue more. Thanks to Mr. Shaeffer, I now have some potentially valuable bits of new information to help me ferret out the true answer. In closing, it seems as if Mr. Sheaffer may have missed or at least misread the sentence in my article that read: disinformation has been an integral part of the secret Corona program. Therefore, it is quite possible that even a witty gentleman such as Mr. Sheaffer may have been duped via disinformation. Since disinformation is a variable that figured heavily into my Kecksburg UFO research, I do not accept my recent findings as wrong—at least not yet. Disinformation is an area that must be investigated thoroughly in the Kecksburg UFO case. If it eventually turns out that Mr. Sheaffer was indeed hoodwinked by disinformation, it may help for him to remember that science is a process of becoming less wrong over time. The UFO Chronicles.com article (Closing the Kecksburg UFO Case Opened Another Mystery) was based upon a whitepaper report that I developed and wrote. The title of that report is: KECKSBURG UFO WHITEPAPER REPORT: Closing the Kecksburg UFO Case Opened a New Mystery. The full whitepaper report is available on my website at: bobwenzelgross.com.